Whether you’ve been a Business Booster for a week or a decade, there’s always more we can learn about one another. That’s why it’s great to have regular 1-2-1 meetings. 3) Be sure to complete every section! Trevor will read this part, so make sure it’s all there—otherwise he’s going to make something up! 4) You have space to put in two of your 45-second commercials here. This is great if you get a last minute sub and want to have something to give them. 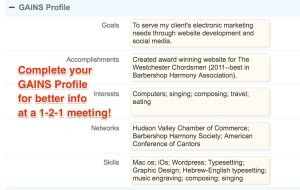 5) Complete your GAINS profile: Goals, Accomplishments, Interests, Networks, and Skills. Networking is all about knowing each other well, and sometimes an interest, hobby, or other network can stimulate lead ideas! 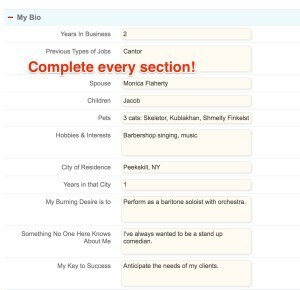 6) Finally, complete your Tops profile. 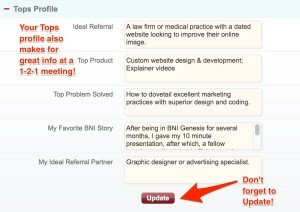 This is a great way to let fellow BNI members know what kind of work you’re looking for. Specific is Terrific! 7) And click that “Update” button!! 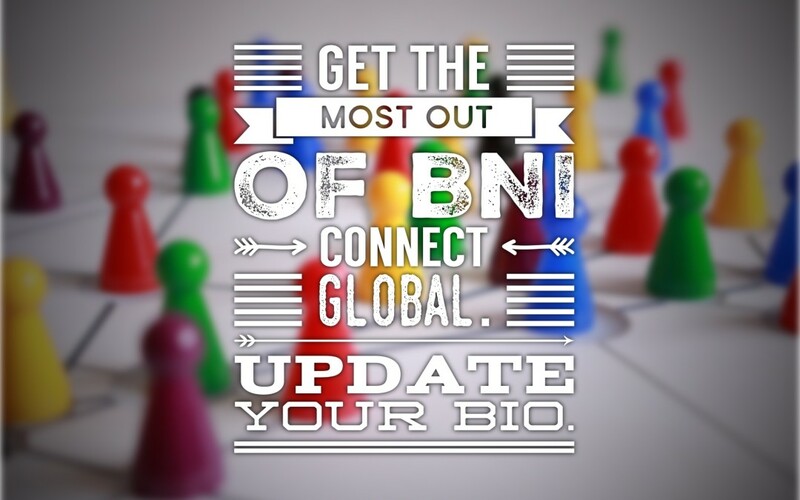 Having this information up to date shows BNI Global that you are looking to do business with more than just our chapter. 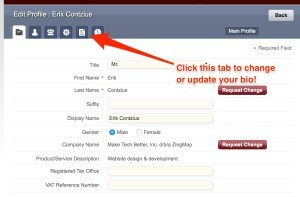 I know I’ve gotten leads from BNI Connect, and so can you! Let me know if I can help you if you’re having trouble with the website!